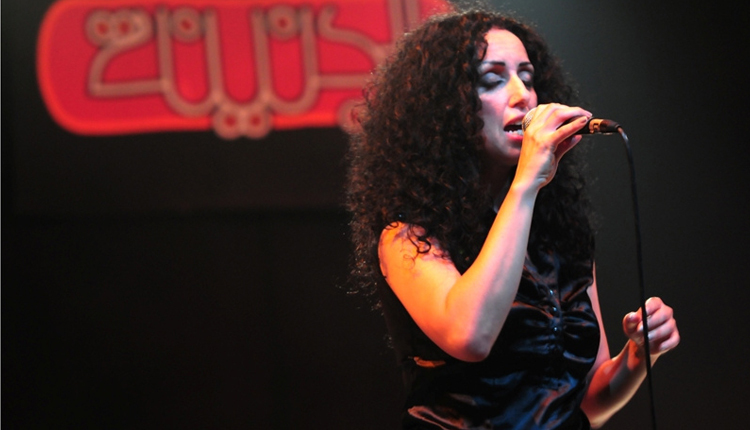 Cairo Opera House’s Small Hall witnessed an event on 24 March 2019 when Algerian singer Karima Nayt shared the stage with Fathy Salama’s Sharkiat for their ‘Wahdani’ album release concert. “This album took us a really long time to release. I am happy we’re finally launching it. Thank you to Karima and everyone who participated in the album,” the Egyptian Grammy Award-winning Salama stated during the concert. In addition to singing and rapping, Nayt was keen to introduce some of her dancing steps on the stage, adding a visual dimension to the concert that gained noticeable appreciation of the crowd, who sang along with her. “Are you happy? You sang a lot tonight, but I really hope you dance too,” Nayt told the crowd during her performance. Special feature rapper Damayan inserted another spirit to the night in addition to a drumming-dancing show performed by Fathy’s buddy percussionist Ayman Sedky during the performing of ‘Nora’. They were backed by Arabic percussionist Ramadan Mansour and the drumming of American Miguel Merino, whose electronic samples produced flavorful grooves, thanks to the tightness of young bassist Peter Laurence and the solid rhythms and solos of experienced guitarist Mohamed Adel, in addition to the special feature of known violin soloist Nancy Mounir. Salama, who never tires of experimenting and reinvention, used various electronic synthesizers, in addition to his standard sounds of organs and pianos, using computer sampling to colour his sound. The long repertoire not only included almost all songs on the album; including Assez Moi De Toi, Romeo Et Juliet, Hinna, April, Maqsoom and Tu Goul Pas, but also represented many North African Rai traditional songs like Wahran, Sallou Ala Alnabi, Zwit Rwit and others. The event was sound engineered by Mafdy Thabet, who Salama thanked after the concert. Nayt, who started her arts career in Cairo as a dancer with the Modern Dance Company of the Cairo Opera House in the late 1990s, started her collaboration with Salama in the early 2000s and they had been preparing this album since then. Nayt has performed in festivals and on stages across the world, both as a singer and a dancer. Since she left Cairo in 2007, Nayt worked mostly in Europe, participating in different dance productions and recording her long-awaited solo album Quoi d’Autre, produced in Sweden. The album won the prize for best CD of 2012 at the Swedish Folk & World Music awards. ‘Wahdani’ album released last week on various music platforms like iTunes, Spotify, Anghami, as well as YouTube, Facebook and other free streaming websites. It was recorded and mastered at Ultra Sound Studio in Cairo by Alaa Al-Kashif, who also won a Grammy for his collaboration with Salama in 2004 in the ‘Egypt’ album. After cooperating with the biggest names of mainstream Egyptian pop in the 1980s, like Amr Diab, Mohamed Mounir, Ali El-Haggar, Medhat Saleh and Anoshka, Salama formed his band Sharkiat, gaining fame in the global jazz scene and collaborating with giants like Senegalese Youssou N’Dour, Cape Verdean Cesária Évora and the source band of Norway. Salama became a pioneer in the alternative music scene, supporting many currently famous bands and musicians, like Masar Egbari, Cairokee, Sharmoofers, Dina El-Wedidi, Mohamed Mohsen, Black Theama and many others, through his workshops and training programmes.